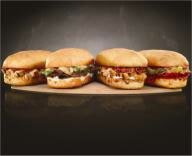 sandwiches are fully-baked in their pizza ovens and are available for delivery. They are priced $4.99. Philly Cheese Steak: steak, American, and provolone cheeses, with onions, green peppers, and mushrooms. Chicken Bacon Ranch: seasoned white meat chicken breast, bacon, ranch dressing, and provolone cheese. Chicken Parm: seasoned white meat chicken breast, tomato basil marinara, parmesan-asiago, and provolone cheeses. Italian: slices of pepperoni, Genoa salami, ham, provolone cheese, banana peppers, green peppers, and onions. "This launch springboards Domino's into the lunch business by providing a product that is high quality, priced right and aimed at convenience-minded people without a lot of time," says Patrick Doyle, president of Domino's USA. "We have high-end ovens in our stores that cost $30,000 and bake our sandwiches at 450 degrees. It gives us a huge quality advantage [competitors] can't match," Doyle adds. "People fed up with brown-bagging or driving to pick up something cold, can save some time and gas by ordering a hot Domino's sandwich for delivery to their home or office." Sure, but these babies aren't light on the calories or fat! The Philly Cheese Steak has 690 calories, 250 calories from fat, 27 grams fat, 14 grams saturated fat, 1 gram trans fat, 90 mg cholesterol, 2080 mg sodium, 72 grams carbohydrates, 3 grams fiber, 4 grams sugars, and 41 grams protein. The Chicken Bacon Ranch sandwich has 890 calories, 400 calories from fat, 45 grams of fat, 16 grams saturated, 1 gram trans fat, 115 mg cholesterol, 2210 mg sodium, 72 grams carbs, 2 grams fiber, 3 grams sugars, 49 grams protein. protein.The Italian has 880 calories, 410 calories from fat, 45 grams fat, 22 grams saturated fat, 1 gram trans fat, 120 mg cholesterol, 2560 mg sodium, 71 grams carbs, 3 grams fiber, 3 grams sugars, 47 grams protein. I have no idea which store you ordered your "Domino's Oven Baked sandwich" from but we were SERIOUSLY disappointed with the chicken and marinara we tried. In the entire 6 or 8 inch length of the sandwich there were exactly 4 small pieces of chicken. There was NOTHING on the sandwich but bread, sauce, a little cheese and the aforementioned smattering of chicken. The taste was pretty good but, if we're paying, we'll stick with the $5 Quiznos or Subway sandwiches in the future. At least you get the condiments and fixing's you want with you sandwich from them. BTW, we ordered from a Domino's at Valley View and Sahara in Las Vegas. Whoever said eat healthy and stick to subway... Subway is just as unhealthy for you if you get cheese and any of the regular sauces that arne't lowfat. Take the napkins at subway for exaple. If you get a combo footlong with chips and a regular drink. It is very comparable to getting a value meal at McDonalds or Burker King. Most of the people I know eat subway because it's quick, cheap, and easy, and it's healthiness. But they don't eat it the way it needs to be to actually be healthy. I'm eating the chicken marinara one right now. I got it because the guy who worked there suggested it. Well it's far from great. I wish I would have tried a different one. The reason I do like this option as opposed to subway or quiznos is because they deliver. Natalie fron Long Island, NY. I ordered all the sandwiches for dinner last week, except the veggie one. VERY DISSAPPOINTED!! Go buy gyro off a street vendor in the city for less money and more meat! Ordered the chicken ranch sandwich, was very unhappy with the size of the sandwich, and it was nothing like the adds they have at the check out counter. When I did get a piece of chicken it was good, but lot of luck finding the chicken. It is shame that a place like Domino's has to lie in their adds. Domino's stop comparing your self to Subway, at least their sandwich is 12" long. This store is in West Memphis, Ar, and I do not like their Pizza either, for the same reason, like of meat. Why don't Domino's answer some of these post. Letting us know why they do not do a better job, with their sandwiches. Would love to hear from them. I have only had the Italian sausage and peppers and was suprised the flavor was like one I would make. It was savory and filling. I am not hired to say this, Domino's has gotten much better. These sandwiches are awesome, unfortunately not $4.99 anymore though, they went up a buck. The italian and philly cheese steak are really good, and they have better bread than any chain deli. Hello everyone. In my personal opinion, I think that Domino's oven baked sandwiches are great being that they have that great source of protein. In the past I suffered from a mild form of M.D. along with the curvature in my spine. I refused to let my specialist tell me what I can or cannot do. Later on I decided to take matters into my own hands by exercise and complete nutrition daily. Check out my blog at http://thekingoffitness.blogspot.com/ to find out more. order online and you have the option of adding extra meat and extra cheese. I have not been charged for doing this either. It's still the same price. My problem is that I think the steak and cheese is too salty, but that could be because I order extra cheese. I like the lava cakes so this and those are way over my calorie count for a whole day.